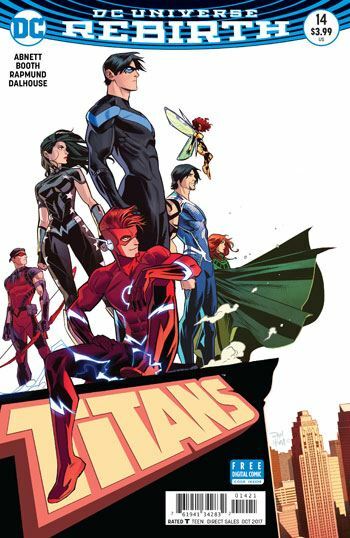 By the end of Titans 14 the reader knows who the traitor is. By the time that point has been reached, almost every member seems like they might be the one. And yes, there really is a traitor, this is not a hoax, a dream, or an imaginary story. As a result, it’s sort of difficult to discuss this issue. Almost anything I say could become a spoiler. But that’s a very good thing. It shows how well crafted this story has been. The possible motivations for treason are fairly wide ranging. Some team members have personal issues with others, which rend them apart. Some have deep secrets, parts of their lives they are keeping hidden from others. Some seem to be being played, and might be lead against their better judgement into betrayal. I was also very glad that some backstory with Garth gets cleared up. Why he has the eye beams, and his connection to the supernatural. In the years before the New 52 Garth had been given his mystical post-cognition abilities, so endowing him with supernatural powers is not so wildly off the mark for the character. As usual, the art is extremely dynamic and eye catching. I have noticed that the anatomy is not always perfect, but I generally enjoy the composition enough that this isn’t a big problem for me. What else can I say without saying too much. 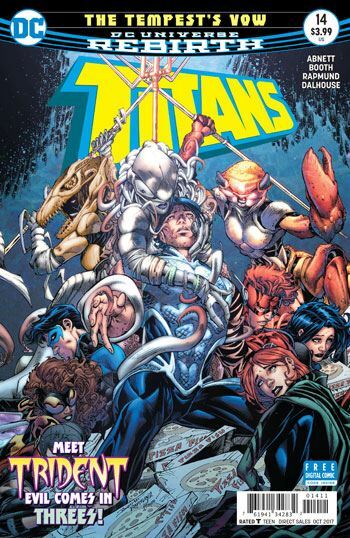 Given the long history of the Titans, and the stories over the past years, the traitor is a far more logical choice than it might seem. I guess you’re just going to have to read it for yourselves.